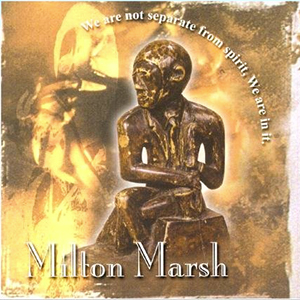 Composer, saxophonist, and flautist, Milton Marsh opens this album with the hot and explosive track entitled, “Fall From Grace,” which features a provocative blend of oriental-styled themes and “jazz-swing.” Achieving the rather satiable Eastern yet soulful flavors distinctive in this piece is Marsh’s primary reliance on strings and piano. These instruments build their melodies on rather interesting phrases and sequential patterns in the minor key-and in some instances, no key at all! In this piece, Richard Johnson’s solo on piano is excellent. So too, percussional extraordinaire, Jazz Sawyer and bass violinist, Brian McCree are full of momentum and spirit as they import the dynamic message evoked by the song title: when we fall from the high marks of approval that others set for us, we must always remember to esteem the intrinsic qualities and values that comprise true personal worth. voice of Henrietta Robinson who eloquently interprets this perfect scene that would last forever. “Alankara” borrows its name from a Persian terminology which means, “a song of inspiration.” First performed in Buffalo, New York in 1986, it now stands as the title and inspiration of my father’s current record label. During his days as a professor at the State University of New York at Buffalo, Marsh recalls this period in his life as a serious time of searching for some sort of personal, spiritual development. Out of this quest “Alankara” was composed. Recorded in Buffalo, New York in 1975, “Behavior Control” is the fourth movement of a larger work. The title reflects the idea that in society no one is immune from some form of control. which features him on alto saxophone and David Eure on violin. In a somber exchange between both instruments, Marsh’s rather mild disposition on sax is reflective of the questionable hope of there ever existing a time when individuals are judged for those brighter qualities found in everyone. The composition, “Natural Order” recalls the esteemed days when African-Americans prided themselves in wearing afros and in fashioning their appearance after whatever seemed most natural, free, and beautiful. As a tribute to this former standard of black beauty, Marsh provides an aesthetic model for how natural order ought to appear at least musically, and presents the possibility for such former sensibility among blacks to live on. The song was recorded at Newbury Sound Studios in Boston in 1986 through a special grant. “Psychic Impulses” was composed in a mind set that affirms that one should transcend their consciousness to a higher mode of thinking. Part of a larger composed work of nine to ten minutes, the theme is solely presented in this piece. from a Persian term which means “trill, the soul speaking with nature.” It was composed around the same time as Alankara.” “Issues” presents a comical perspective on today’s issues. In this conversation between instruments, a string quartet takes on the anthropomorphic gesture of speech and engages in sometimes mild, sometimes hostile dialogues with each other as would humans. Metamorphosis” features a structured composition that exhibits rich, modal harmonies and a “broken time feel” intended for a nine-piece ensemble.